After a knee replacement, our advice is to exercise more than you have in years. Focus on total body muscle building and weight optimization. 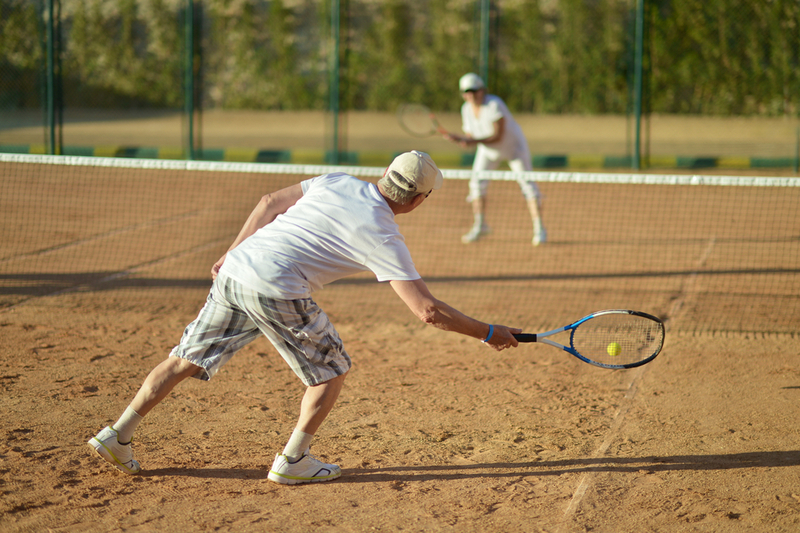 You can likely return to most sports when you are fit enough to protect your joints. The wearing out of plastic components most often occurs in mal position or mal tracking of the joint. Improved tracking is facilitated by strong muscles, better balance and more normal gait, all of which come from a strong core and strong trunk muscles. Total body fitness conditioning is the key to a long lasting joint replacement. Most modern knee replacements have plastic components that are interchangeable if worn out. So why limit an entire later lifetime of sports by the fear of them wearing out? Finally to running: Running is the most common request we get from our athletes who need total knees. The data is that whether you run a mile or walk a mile, the total force on the joint is the same, since you take fewer steps when running. The peak forces are higher depending on the type of surface, the smoothness of the gait, the shoe wear and other factors. If you must run, run with great form on soft surfaces with new absorbent shoes. I have never seen a total knee become worn out from running nor have any of my peers who I have asked. In general cycling is a more logical sport as it limits the impact, but logic is not the reason we run. To sum up, if you've been told you need a total knee replacement, first check the options and make sure you really do need one. If you end up getting a total knee replacement, it's not the end of your active life by any means. Get back to your exercise, work on building muscle and enjoy your freedom to move. 1. Kuster, M. S., Spalinger, E. S. T. H. E. R., Blanksby, B. A., & Gächter, A. N. D. R. É. (2000). Endurance sports after total knee replacement: a biomechanical investigation. Medicine and science in sports and exercise, 32(4), 721-724. 2. Naudie, D. D., Ammeen, D. J., Engh, G. A., & Rorabeck, C. H. (2007). Wear and osteolysis around total knee arthroplasty. Journal of the American Academy of Orthopaedic Surgeons, 15(1), 53-64. 3. Chang, M. J., Lim, H., Lee, N. R., & Moon, Y. W. (2014). Diagnosis, Causes and Treatments of Instability Following Total Knee Arthroplasty. Knee surgery & related research, 26(2), 61-67. 4. Layne, J. E., & Nelson, M. E. (1999). The effects of progressive resistance training on bone density: a review. Medicine and science in sports and exercise, 31(1), 25-30. 6. Ostrowski, K. J., Wilson, G. J., Weatherby, R., Murphy, P. W., & Lyttle, A. D. (1997). The Effect of Weight Training Volume on Hormonal Output and Muscular Size and Function. The Journal of Strength & Conditioning Research, 11(3), 148-154. 7. Dixon, M. C., Brown, R. R., Parsch, D., & Scott, R. D. (2005). Modular fixed-bearing total knee arthroplasty with retention of the posterior cruciate ligament. The Journal of Bone & Joint Surgery, 87(3), 598-603. 8. Farris, D. J., & Sawicki, G. S. (2011). The mechanics and energetics of human walking and running: a joint level perspective. Journal of The Royal Society Interface, rsif20110182.